Our first annual Oregon SHAPE membership drive starts today and goes until April 8th! 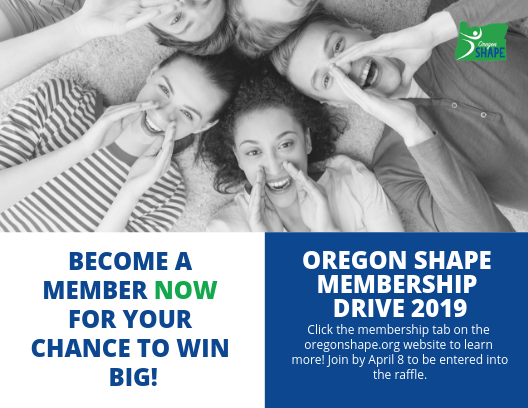 Becoming a member of Oregon SHAPE is a win-win in our books. “But, what do I get out of becoming a member?” you ask. Great question! For only $50 a year, your membership gives you access to some incredible benefits. Here are a few of the exciting special perks! Professional & Student Scholarship Fund – $10 of your Oregon SHAPE membership fee goes to a professional and student scholarship fund. Each year members will have an opportunity to apply for the scholarship in which they can put it towards attending a conference, purchase learning materials, etc! Reduced Conference Rate – You receive a reduced rate to attend the 2019 Oregon SHAPE Fall Conference! FREE registration to all Oregon SHAPE Workshops – This includes the Oregon SHAPE leadership conference this summer! Non-members will be charged a fee. Intrigued? You can find out about the rest of our membership benefits here. You won’t be disappointed! All NEW members who join during our membership drive (ends April 8) will be entered for a chance to win some sweet Oregon SHAPE swag, valued at over $50! Who doesn’t like free swag? HOW DO YOU WIN BIG? Need a BIGGER incentive? All new and current members who refer their colleagues will be entered in a raffle and have a chance to win some BIG PRIZE$!!! How do you convince your colleagues to join? Don’t worry, we’ve got you covered with this awesome digital postcard! We’ve given you access to a PDF file and a PNG file to download and share out through e-mail or social media! Make sure to tell them to include your name on their application form, so we can give you credit for the referral! You can thank us later when you win the grand prize! We knew you would ask eventually! 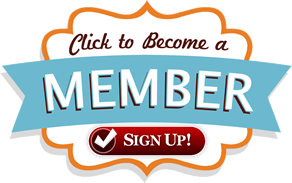 Click on the button linked below to sign up for your Oregon SHAPE membership! Make sure to list the person that referred you on the application form so they get credit! Do you have a question? Reach out to us at oregonshape@gmail.com and we would be happy to find you some answers! Oregon SHAPE’s State Teacher of the Year program would like to honor excellence in our profession by recognizing three outstanding teachers! The Teacher of the Year awards are given in recognition of outstanding teaching performance and the ability to motivate today’s youth to participate in a lifetime of physical activity. These individuals were honored during the 2018 Oregon SHAPE Conference this past weekend in Bend. Meet our Teachers of the Year! Christy Wilson’s learning environment fosters inquiry and a joy of movement, two things Christy models daily. She is involved at her school on the leadership committee, at the district level as a member of the active student’s cadre developing classroom physical activity and spends time collaborating with PE colleagues around the nation researching best practice and new ways to engage her students. Her love of teaching evident daily and relationship with her students is number one. Christy is in her 17th year of teaching Physical Education and is currently teaching at Raleigh Park Elementary in the Beaverton School District. Jordan Werner may only be in his 6th year of teaching, but he has changed the way physical education is viewed at Riverside Elementary, Grants Pass School District and community. In his short time as a teacher, he has changed PE from a sports-only curriculum to one that is focused on physical literacy, positive social interaction, and cooperative learning. His PE program places an emphasis on individualized learning, cooperative learning, and physical literacy through a variety of different activities to ensure that every student finds something to value and enjoy throughout the year. Todd Stoddard has made a significant impact on the PE program at Lakeridge Junior High School in the Lake Oswego School District in just two years. Todd helps students identify activities that they enjoy doing that can be pursued outside of school and understand the importance of personal fitness. His program by guiding students through a wide variety of activities including less traditional ones like dancing and rock climbing. Tod has gained the full support of his administrators, parents, community members, students, and fellow staff members through various activities, including organizing after-school events, giving presentations, and creating personal relationships with stakeholders. Todd is in his 7th year of teaching.